The famed Mirror Lake, at the Valley’s eastern end, has long been viewed as a thing of beauty and permanence. Yet, in this Bicentennial year of celebrating history and heritage, Mirror Lake has all but ceased to be a lake. It is fulfilling its inevitable destiny. Mirror Lake, like all lakes, is incapable of lasting indefinitely. Moving water always carries sediment to some degree. Upon entering the quiet waters of a lake, the current drops most of the sand, silt, and clay it carries, building deltas on a large scale, sandbars on a small scale, and generally lessening the depth of the lake. In the case of Mirror Lake, this process has been occurring ever since its formation by landslides which crossed Tenaya Creek and backed its waters into a lake about one-half a kilometer long. This occurred centuries before white man’s presence in the Valley. The filling process had reduced the lake to a fraction of its original size and depth by the time it was given the name Mirror Lake for its reflective qualities. The pioneers of the 1850’s were seeing only a remnant of the beautiful reflections. It appears that the fame of Mirror Lake began with photographers Charles L. Weed in 1859 and Carlton E. Watkins in 1861. 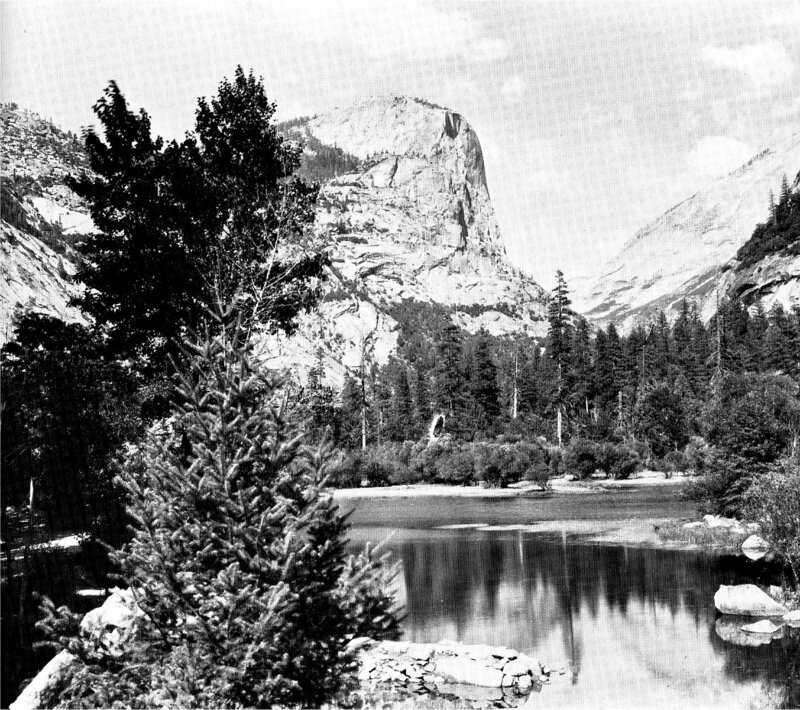 Thereafter, Mirror Lake became a special place to park visitors. In the 1860’s, Capt. William James Howard built a summer house on the lake’s shore. A dance floor, measuring sixty feet by forty feet, extended out over the water. The Mirror Lake House, as it became known, was a favorite night spot. A one-mile toll wagon-road led up to the lake from the Valley. In 1879, the commissioners of the state board governing Yosemite Valley and the Mariposa Grove bought the toll road, made it toll-free, and removed Mirror Lake House. From this point, the battle to “save” Mirror Lake began. There was talk in 1882 of clearing trees and brush in order to improve the lake view. By 1884, it was recognized that sediment was filling the lake and reducing its size and beauty. The first dam was constructed that year, and consisted of a few large granite blocks moved into the narrowest point of the lake’s outlet. The lake’s size increased by six times. But sediment deposition began anew farther up the lake so in 1885-1886, a retaining dam was built on Tenaya Creek above the lake. This would trap sediment before it reached the lake, it was believed, to save and restore Mirror Lake; by 1887, however, it was obvious this was only a short term remedy. The commissioners felt “improvement” and “preservation” went hand in hand and complimented each other. Under Park Guardian, Galen Clark, a low, “natural” dam was constructed at Mirror Lake’s outlet in 1889. Two years later, it was anticipated that a gate would be installed in the dam which would make it possible to flush the lake and allow sediment deposits to move downstream. It is unclear whether this was ever done. The question of “preserving” Mirror Lake has risen time and again since the early pioneer years. Dredging has taken place repeatedly, the last time in the summer of 1971. At that time it was done to prolong the life of the lake and to obtain a source of native, granitic sand for sanding winter roads. Now, however, Mirror Lake no longer will be artificially perpetuated. In keeping with the vision for all National Parks, natural processes will be promoted and safeguarded. In the coming years and decades, with each spring torrent, deposition will produce an increasingly shallower and smaller lake, until eventually it will become a meadow. This is identical to the process which has made the floor of Yosemite Valley as beautiful as it is today. This is a process which should not be disturbed. It is believed that preservation of natural features, systems, and landscapes is a dynamic process, achieved by permitting all natural processes to occur undisturbed. Disturbance of natural processes yields unnatural results — thus the decision to allow the destiny of Mirror Lake to be naturally fulfilled.